Today’s Message: The future belongs to those who believe in the beauty of their dreams...Happy graduation day. Situated at the heart of Bethlehem the Salesian Technical School stands tall as ever, with its distinguishing remarkable appeal to the youth who aspire to put their hands on the technical trade. The School is run by the friars of Salesian Order, who at large focus on the education of the youth, in the path traced out by Saint John Bosco. Considered for its innovations and for its peculiar appeal to the youth of the locality this is the one and only technical school in this region of Palestine. 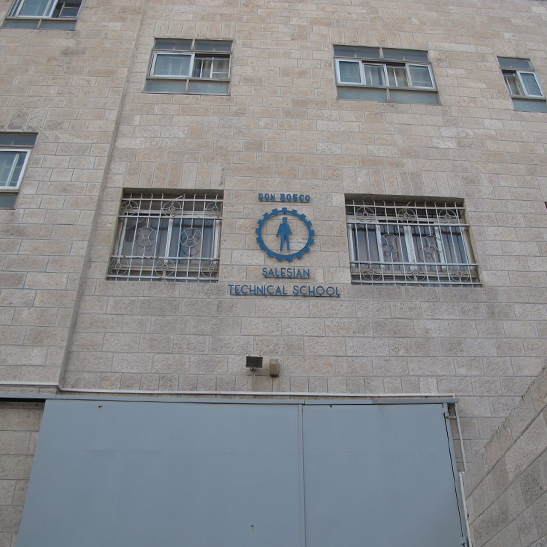 The School from its inception in 1967 till today has the distinction of teaching 30,000 students in and around Bethlehem. In an age of modernity, largely digitalized, dominated by information technology, a technical school has its task cut out: technology vs manual operations. At the finishing of their studies the students are assured of a trade in a specific sector. As such the School offers courses on Turning, Electricity, Auto Mechanics, Autotronics, electronics and carpentry. It caters to students ranging from the 10th Grade to the 12th. At the end of their school studies there is the Common Government exam, ‘tawjihi’ (the success rate last year was 85%). While students at large settle down to work in the industrial sectors, there are a few who pursue their further studies out of Palestine. This year the school has 140 regular students, who frequent at the morning and 160 students for various ‘courses’ who frequent in the evening. For the human development of its pupil, the management proposes a topic every month which is developed systematically: The formation of the students is achieved through discipline, gentle accompaniment in changing the conduct for better, and above all through the concrete presence (of the Salesians and their staff) among the students. Being a father and a friend of youth, the Salesians who are helping the running of the School find themselves often amidst very loving pupils; after all education is not limited to the class room. The school holds the pride of having experienced teachers; some of them have contributed to it more than 30 continuous years. The School has a preferential option for the poor students who come from families that find difficult both the ends meet. This explains the actual situation of our pupils. While aiming at the optimum education for every students the institute depends to a great extent on the financial backup of its benefactors. Meeting the cost of salary of the teachers, maintenance of the house, electricity, water etc., requires a concrete monetary help. Hence it appeals to the generosity of the benefactors (in both cash and kind). Contact us with the following links; facebook, internet, email, phone etc.